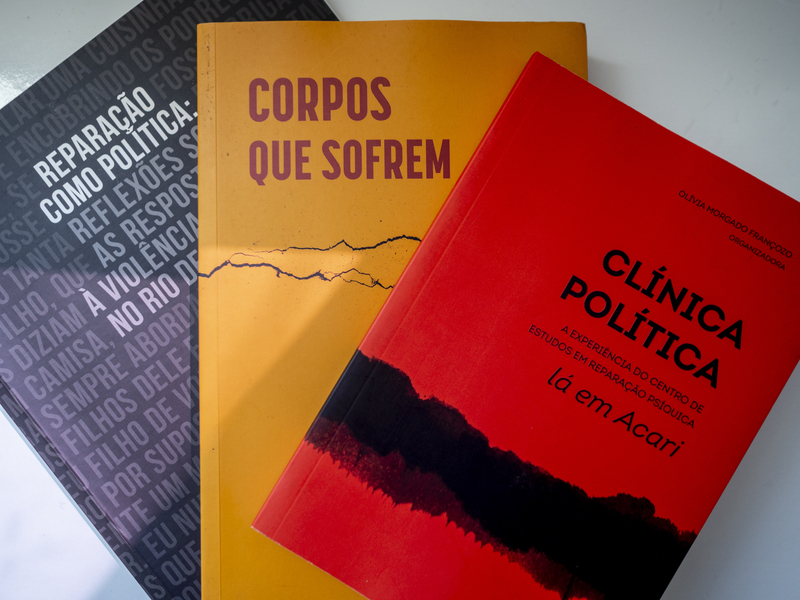 On Friday, April 5, the Federal University of Rio de Janeiro’s Institute for Philosophy and Social Sciences (IFCS/UFRJ) hosted a collective book launch followed by a panel debate on state violence with the books’ authors and other invited speakers. The event was part of an initiative organized by IFCS professors called the “Circuit for Democracy“—a series of events including panel debates, documentary screenings, book launches, and conversation circles held throughout the month of April with the aim of discussing the 1964 military coup and what has happened in the 55 years since the start of the military dictatorship in Brazil. 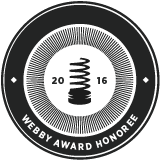 To see the full schedule of events, click here. 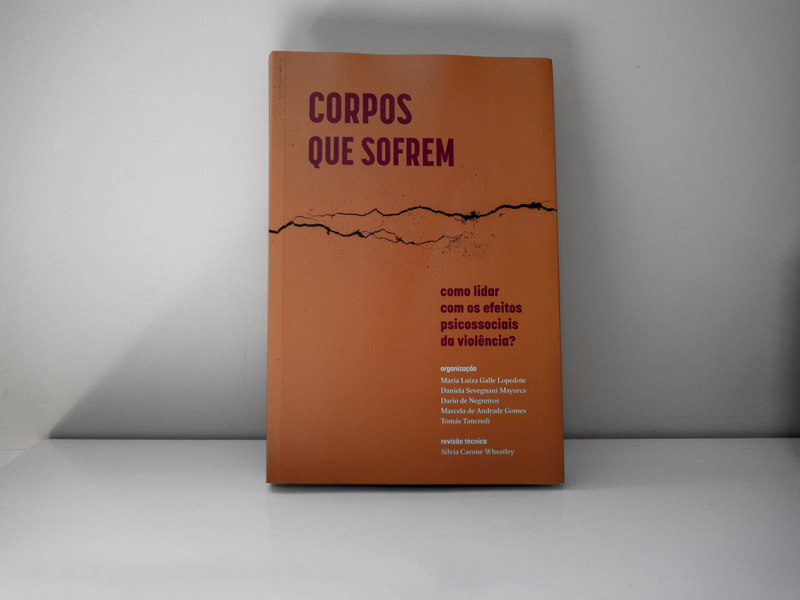 The collective book launch was introduced and moderated by psychologist Daniela Sevegnani Mayorca, one of the authors of the book Corpos Que Sofrem: Como Lidar com os Efeitos Psicossociais da Violência? (“Bodies That Suffer: How to Deal with the Psychosocial Effects of Violence?”). 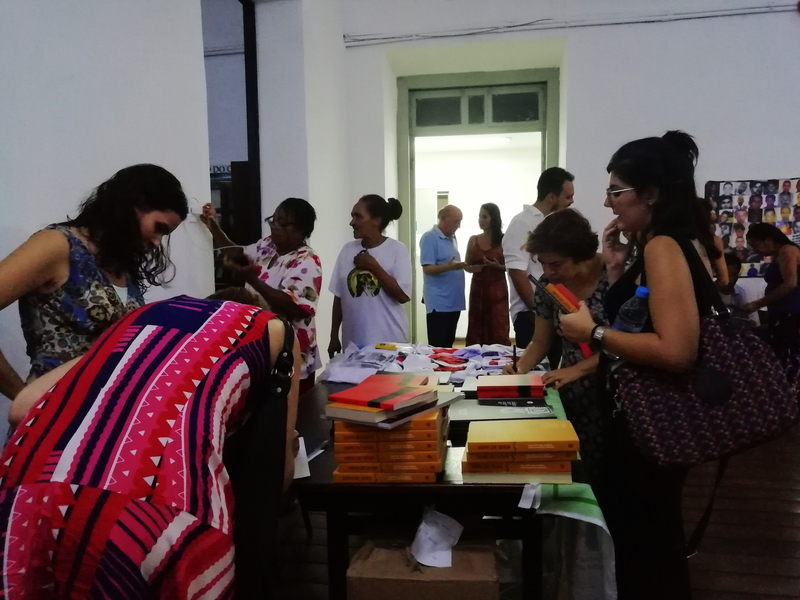 The book is the product of several lectures held at the Santa Catarina Center for Psychological Remediation Studies, combined with different debates and roundtables hosted by the book’s organizers. Freixo then talked about the role of universities in the fight against fascism, referring to a debate that took place earlier that same day in front of the Federal University of Rio de Janeiro (UFRJ) in which he took part, despite attempts by Social Liberty Party (PSL) representatives to bar his participation. “Universities should not bow down to fascism because they would be the first places to shut down—the first places that would be prevented from functioning,” he stated. According to Freixo, the current political struggle is very complex and the opposition has the crucial role of rebuilding collective hope. He stated that he prefers to not use the term “resistance” because “it means that we are losing and I don’t want to lose—I want to progress.” Freixo concluded by saying that health and mental health are important tools to build hope that should be used to fight against the current government’s notorious violence. Olivia Morgado Françozo, a psychologist and co-author of the book Clínica Política: A Experiencia do Centro de Estudos em Reparação Psíquica ‘Lá em Acari’ (“Political Clinic: The Experience of the ‘There in Acari’ Center for Psychological Remediation Studies”) then took the floor. The book is the culmination of the Center for Studies in Psychic Reparation (CERP) project at the Institute of Studies on Religion (ISER), which emerged through a partnership between the British Council’s Newton Fund and the Amnesty Commission of the Brazilian Ministry of Justice. 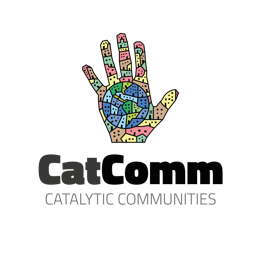 The project aims to develop tools to help professionals from Brazil’s Unified Health System (SUS) and Unified Social Assistance System (SUAS) to work with individuals dealing with trauma resulting from state violence of the past dictatorship. The project involves approximately thirty professionals from the favela of Acari, in Rio’s North Zone, several of whom now run clinic groups with victims’ families aiming to help remedy the psychosocial effects of state violence. Françozo said that the project was intended to address past state violence. 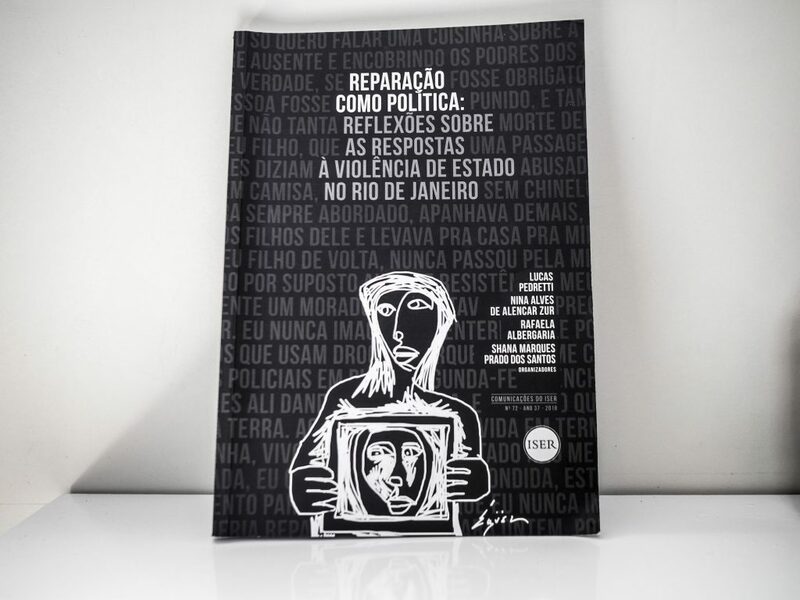 “When we started, we had no idea that, as Marcelo Freixo said, the project would become so relevant to the present day.” The book includes the results of five months of weekly technical lectures on matters such as the silencing and banalization of violence. These phenomena have been so “frequent, repeated and embedded in Brazil’s history that cases of violence wouldn’t reach [healthcare] professionals operating in one of the most violent parts of the state of Rio de Janeiro, and who still wouldn’t get any treatment requests. That was when we started asking ourselves: why are these cases not reaching us?” According to Françozo, the answer partly lies in the individualization of violence. To address this issue, she highlighted the importance of constructing collective experiences and understanding that “murder not only changes the family of the victim, but also the neighborhood, the city, and eventually the country, too.” This is crucial to properly reach out, understand, and treat individuals and communities dealing with trauma resulting from state violence. That is why a group clinic strategy was deemed essential in order to de-individualize violence and, at the same time, intervene in individuals’ private experiences. Tânia Kolker, an institutional analyst and co-author of Political Clinic, elaborated on Françozo’s point by saying that public policy should not only address the tangible and visible effects of state violence—such as those perpetrated during the dictatorship—but should also extend to all individuals and groups that are indirectly affected by all forms of violence. She stressed that the event is not only a book launch but also an occasion to remember the 55th anniversary of the 1964 coup and the violence that was perpetrated by the government during the dark period of the dictatorship. Finally, she highlighted the importance of occupying the streets and academic spaces to intensify discussions on these issues because doing so “is an important act of resistance,” particularly in the current political moment. 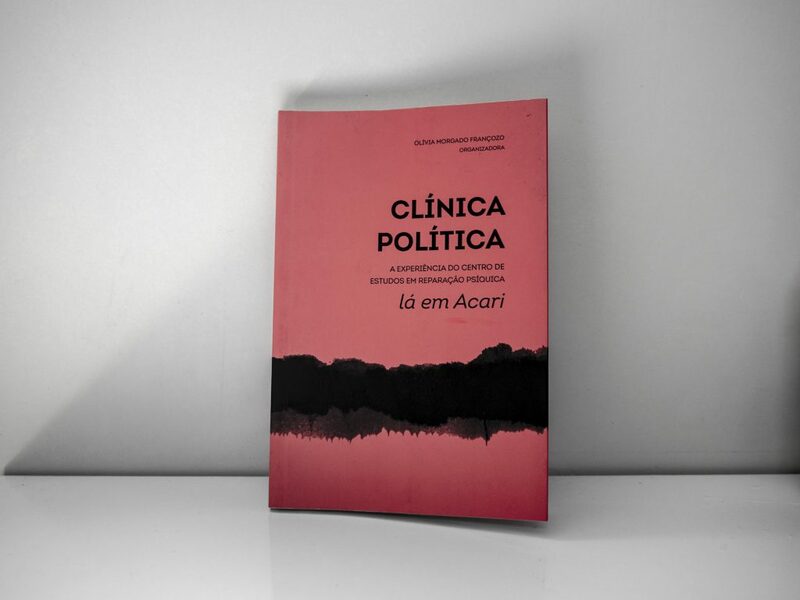 The last publication, Reparação Como Politica: Reflexões Sobre as Respostas À Violência de Estado no Rio de Janeiro (“Remediation as Politics: Reflections on Responses to State Violence in Rio de Janeiro”), was presented by two of its four authors, Lucas Pedretti and Rafaela Albergaria. The research project, of which the book is a result, is also an initiative of the Institute of Studies on Religion and addresses Rio de Janeiro’s remediation politics on state violence by critically discussing the past and the present. Pedretti stressed from the beginning that “all violence of the present is a legacy of the violence of the dictatorship.” He discussed remediation politics and how “there are some kinds of violence that were never part of any public policy” and that instead permitted the naturalization of “black, peripherical bodies deaths” to happen. “It is necessary to talk about remediation, but also about memory, truth, and justice in relation to other periods of violence, such as the current one—the genocide of the black population in the favelas of Rio de Janeiro,” said Pedretti. Rafaela Albergaria fervently continued along the same lines. She stressed that racism is a structural and institutional problem in Brazil, a country that has been “founded and forged by racialized violence”—first against indigenous people, then against black slaves, later against opponents of the dictatorship, and today against black populations. The book is key to understanding that “violence is systemic and that we cannot talk about violence without talking about racism…and how we [black people] have historically been depicted as killable bodies,” she said. According to Albergaria, and as discussed in her publication, public policies need to address and be capable of stopping the continuation of past violence in the present. Therein lies the meaning of remediation: if it is true that homicide can never be truly remedied for the victim’s family, what remediation politics can do is ensure that the violence stops being negated such that perpetrators are held responsible, the government is held accountable, and victims are treated as victims. This article was written by Daiana Contini, and published on April 11, 2019.